New to the league, or haven’t played kickball since your grade school days? No worries we got your back with the details you want to now about the game! Kickball is a simple game that is played by finely tuned athletic (drinking?) machines. The complete set of rules are at the following link ... <here> However, some of the finer points of the field in general are outlined below! Pitcher's Strip - Obvious. Pitch from behind this line. The ball has to bounce at least twice BEFORE crossing home plate. To be a strike, the ball should pass within 1 foot left, right, or above the plate. Imaginary Line - It's imaginary, it doesn't exist, but you can get called for crossing it. All defenders must stay behind this line until AFTER the ball has been kicked. You can move around as much as you want before the pitch as long as you're behind the line. Running Through First - After you've kicked the ball run to first. Period. You have the choice to stay at First or attempt to advance to Second. If you decide that staying at First better suits you (and the team) then run THROUGH the safety base. This base is located along the foul line and slightly away from the First baseman. Tagging the safety base before the ball guarantees your safety. This is similar to softball. See the diagram. First and Home are the only bases you can run through without getting out. 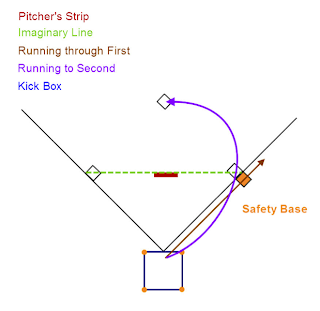 That is, you cannot run through Second or Third and expect to be safe unless your foot is on the base. That is, if you're on Second or Third you must stay on the base to prevent being tagged or thrown out. That is, don't miss Second or Third base! I think my point is clear. Running to Second - After you kick the ball and running towards First let's say you've decided it's better for the team (and you) to try advancing to Second. If this is the case, you MUST tag the First base that is in the field of play. See the diagram. And if you haven't understood yet...keep your foot on the base. Pop-flys/Tag-ups - I don't think we explained this one well enough last season...so here's my attempt. If you find yourself on base, and the ball is kicked high, STAY ON OR NEAR THE ORIGINAL BASE. Scenario 1: The ball is dropped, hits the ground, gets by the defender, etc. You advance to the next base. Your safety is not guaranteed. Scenario 2: The ball is caught for an out of the kicker. Because you stayed ON OR NEAR THE ORIGINAL BASE you remain at the original base (foot on the base). Scenario 3:The ball is caught for an out of the kicker. Because you stayed ON OR NEAR THE ORIGINAL BASE you tag back on the original base and attempt to advance to the next base. Your safety is not guaranteed. Overthrows - If the ball is overthrown, out of the field of play (behind 1st, 3rd, or home), runners on base may attempt to advance one base. Your safety is NOT guaranteed. TREE! - This field is smaller than the one in the spring. There are also more trees in the field of play. If a ball hits a tree it becomes a foul ball. It cannot be caught as an out. Remember that that 4 Fouls = 1 out. 3 Strikes = 1 out. 4 Balls = Walk. 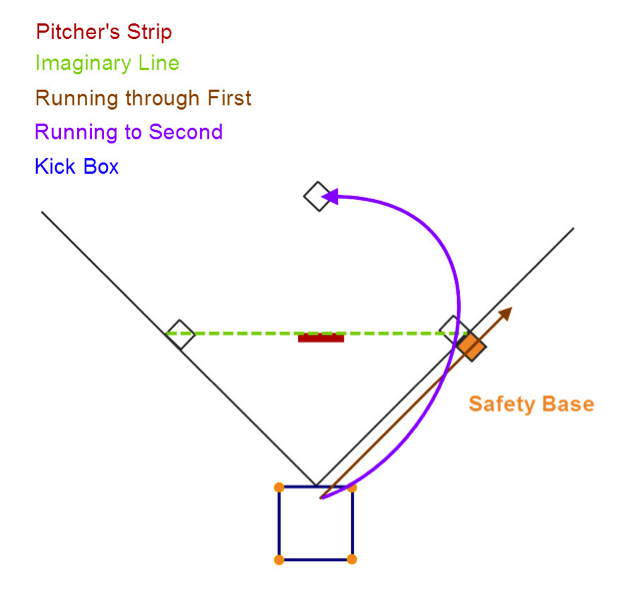 Kickbox - This is an imaginary box outlined by four cones around the home plate base. The ball must be kicked within the confines of this said box, else the kick is considered invalid. You are welcome to start outside of the box and come in contact with the ball, in the box, as you come running towards it (Happy Gilmore style). Just make sure contact occurs within the box! Make sense? If not no worries, ask your teammates, another team, or a board member. We’re all friendly people and just want to kick some balls!